Explore our partner resources listed below. 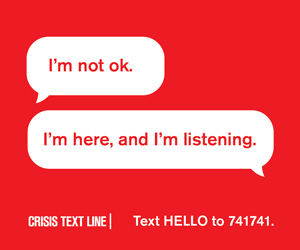 text HOME to 741741 for free, 24/7 crisis support in the US. Boulder Crest is a 501(c)(3) nonprofit organization, founded in 2011, that supports combat veterans and their family members, and first responders, who struggle with a number of mental health challenges as a result of their service. The mission is to solve the mental health crisis and train military members, veterans, and their families dealing with PTSD and combat-related stress, to help them live productive, fulfilling, and service-oriented lives at home, as well as provide free, world class, short-duration, high-impact retreats. Headstrong was founded in 2012 through a partnership with Weill Cornell Medical College, one of the nation’s leading mental health care centers. With the help and direction of top clinicians in the country, Headstrong developed a comprehensive mental health treatment program for post 9/11 veterans dealing with PTSD, Military Sexual Trauma, addiction, anxiety and depression, trauma, grief and loss, and anger management. The SHARE Military Initiative at Shepherd Center is a comprehensive rehabilitation program that focuses on assessment and treatment for active duty or separated service members who have served in the U.S. military since September 11, 2001 and who are experiencing symptoms of or have a diagnosis of mild to moderate brain injury, or concussions and any co-occurring psychological or behavioral health concerns, including post-traumatic stress. SHARE Military Initiative provides hope, assistance, support and education to service members and their families during their recovery treatment and beyond. Boot Campaign’s revolutionary Health and Wellness pipeline provides veterans access and funding to individualized and comprehensive roadmaps to recovery from invisible wounds of war. Joining forces with evidence-based treatment and training partners across the United States, Boot Campaign helps veterans and their families struggling with traumatic brain injury, post-traumatic stress disorder, chronic pain, self-medication and insomnia. Boot Campaign implements a holistic plan of attack grounded in the most cutting edge wellness training with treatment programs fully customized to each individual. LoveYourBrain is the message that embodies our positive approach to brain injury prevention and healing. Our programs are designed to build community, foster resilience, and help people understand the importance of loving your brain. If you have experienced a TBI (including concussion) or are a caregiver or support person, we invite you to join our yoga community! Through this program, we hope you discover your inner resources for learning, growing, healing, and thriving. o create a culture of shared experiences related to TBI, our program is only open to the TBI community at this time. TBI is caused by a bump, blow, or jolt to the head, or penetrating head injury. Get connected with one of IAVA’s Veteran transition managers through the Rapid Response Referral Program. RRRP is IAVA’s high-tech, high-touch case management and referral services program. The qualified Veteran Transition Managers act as transition navigators and advocates, assisting veterans to identify and access top benefits and services, both governmental and nongovernmental, for example, the Semper Fi Fund, Operation PAVE, TAPS, the Veterans Crisis Line, Salute, Inc., VA Vet Centers, and more. Importantly, we take clients with all discharge statuses, including those whose status might otherwise make receiving benefits difficult. Join a Mission Continues service platoon. In 2013, The Mission Continues introduced a new way for veterans to continue serving at home – the service platoon. A service platoon is a team of veteran and non-veteran volunteers that mobilizes together to solve a specific challenge in their community. United by the common bond of service, platoons offer veterans the opportunity to make an impact in their community, and connect with others through regular social and networking events. It’s an opportunity to serve alongside a motivated team and tackle a tough and meaningful mission. It’s an opportunity to make a difference. Utilize the Blue Star Families support network. Military life is different and can be difficult. Frequent moves, deployments, and transitions can make it hard for military families to establish strong, trusted networks. Blue Star Families was founded by military spouses in 2009 to empower these families to thrive as they serve. We're committed to strengthening military families by connecting them with their neighbors – individuals and organizations – to create vibrant communities of mutual support. We believe we're all stronger when we take care of one another.